Longmeadow, MA— Bay Path is one of a select group of colleges and universities and one of four women’s college selected nationally to collaborate with Google to pilot their offerings in their new Applied Computing Series. These courses aim to increase undergraduate access to quality data science and machine learning education by leveraging new technologies and teaching styles. The Applied Computing Series teaches the foundations of computer and data science through hands-on, project-based course content, topically designed to attract students who might not consider themselves destined for a technology career. The most advanced of these offerings, the Applied Machine Learning Intensive will be a 10-week summer program designed to offer non-CS majors a crash course in data engineering and machine learning. All of the courses leverage tools and techniques used at Google and in the wider tech industry, while also teaching the non-tech skills needed for success in every industry; e.g., critical thinking and problem-solving, collaboration, and the ability to communicate and network. The learning content for the Applied Computing Series is distributed via a “flipped classroom” model of instruction, where students review, study and practice material on their own, then work on collaborative projects in groups with coaching by their instructors. To develop the most robust curriculum, Google is building these courses in partnership with highly-regarded computer science academics. The Google instructional team builds the centralized content and in-class projects so that students have relevant, real-world problems to solve; the courses are then facilitated by Bay Path University faculty in STEM-adjacent fields. 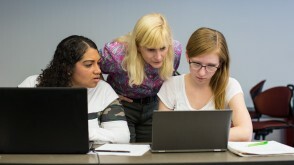 Students participating in the program develop skills that will position them for entry-level positions in the burgeoning machine learning workforce; work with Google engineers to learn about the tech industry’s working environments, challenges, and nuances; and immerse themselves in a project-based curriculum to help reinforce the computer and data science principles they’re learning. To learn more about this initiative, visit www.baypath.edu/Google. Bay Path University was founded in 1897. With locations in Longmeadow (main), East Longmeadow (Philip H. Ryan Health Science Center), Sturbridge (MA), and Concord (MA), Bay Path’s innovative program offerings include traditional undergraduate degrees for women, The American Women's College on-ground and online, the first all-women, all-online accredited bachelor’s degree programs in the country; over 30 graduate programs for women and men; and Strategic Alliances, offering professional development courses for individuals and organizations. Bay Path’s goal is to give students confidence in the fundamentals of their chosen field, the curiosity to question the ordinary, the leadership to show initiative, and the desire to make a difference.